Over the past two decades, diesel engines have become more popular in the US market and during that time, there has been a growing demand for a Ford F-150 with a diesel engine. The discussions really picked up in the early 2000s and inside information suggested that the Motor Company was working on a diesel F-150, but when fuel prices skyrocketed in 2006, that project was allegedly shelved. Fast forward to 2014 – fuel prices were back down and the American market was seeing a new influx of diesel-powered vehicles. One of those was the Ram 1500 EcoDiesel, which set the bar high for half-ton fuel economy while also showing that a “small diesel” would appeal to US buyers. Once Ram fans had their half-ton diesel, the demand for an F-150 with an oil-burner intensified. With the arrival of the 2018 Ford F-150 PowerStroke, decades of demands have been answered and this new engine is everything that the truck community had hoped. I traveled to Denver, Colorado as a guest of the Motor Company to drive the 2018 Ford F-150 with the 3.0-liter PowerStroke diesel and while there, I got to experience the new engine in a variety of key situations. We got to play on an off-road course for a bit and the diesel F-150 did great in the mud, sand and water, but where this new mill really shines is on the open road with a horse trailer hooked up out back. As a horse owner, I test every new truck and SUV with a standard 2-horse trailer that weighs around 5,000 pounds. 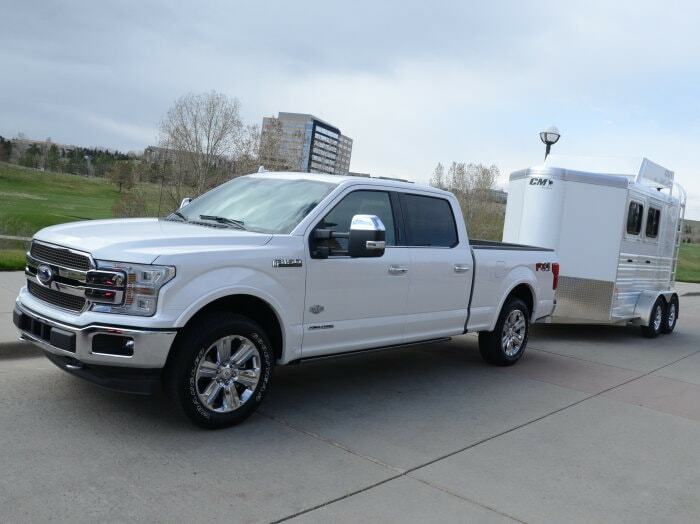 At the media first drive program for the new PowerStroke F-150, they had three trucks hooked to trailers – one with an enclosed car trailer, one with a boat and one with a 2-horse trailer that weighed 5,040 pounds. It was the perfect stand-in for my normal test trailer, so that was what I picked to take to the streets of Colorado. The new 3.0-liter PowerStroke diesel delivers 250 horsepower and 440lb-ft of torque, making it slightly more powerful than Ram’s 3.0-literl EcoDiesel at 240/420, but with a towing capacity of 11,400 pounds, the new Ford diesel offers significantly greater functionality (than the previous generation Ram 1500). Even in the thin Denver air, the PowerStroke diesel engine handled the added weight with ease, smoothly pulling the trailer up the steepest hills in the area and cruising at highway speeds without breaking a sweat. The functionality of the diesel engine is a key reason why people have been wanting one in the F-150, so it comes as little surprise that the new PowerStroke handled this average trailer so easily. Moving out from a stop, all of that torque immediately gets the combo moving without any suggestion of boost lag, with the 10-speed automatic transmission zipping through gears as speeds climb. This small engine allows the F-150 to accelerate as quickly as a horse owner would want from a stop and when cruising at speed, that extra weight is hardly noticeable when you hit a steep hill or some other situation that requires lots of mid-range power. For someone who wants a little more grunt from their new F-150 when pulling a 2-horse trailer, this engine is just about perfect. After spending a few hours with the diesel F-150 and the horse trailer, I moved over to a truck without any extra weight out back. With this truck, I took to the streets of Colorado to experience the power of this new diesel engine without any limitations (other than local laws, of course). I set the drive mode to Sport, affording the crispest and most aggressive shifts and the most positive throttle response from the new F-150. On a hard launch, the torque curve is a bit smoother than the Ram EcoDiesel, with less of the hard spike when the boost levels ramp up, and that big torque moves the truck up past any posted speed limit in impressive fashion. I don’t expect that many racers are going to pick the new PowerStroke F-150 for a go-fast project, but for those perspective buyers who want the working ability of a diesel and superior fuel economy – this new engine doesn’t include any compromise in daily driving performance. Finally, after experiencing the new Ford F-150 with the 3.0-liter PowerStroke diesel in the mud, with a horse trailer and without any extra weight, we took a new half-ton diesel truck on a loop designed to test the fuel economy capabilities in the real world. This drive route had an even balance of city streets and highway driving, with plenty of steep uphill grades, traffic and stoplights along the way. The journalist who got the best average fuel economy on this route got a trophy and a cash prize, so some people went all out, coasting down hills, folding in the mirrors, keeping speeds low in all situations – and that allowed them to average around 40 miles per gallon. I am not patient enough for all of that, so on the fuel economy loop, I drove the PowerStroke’d F-150 conservatively, but I drove in a manner that wouldn’t enrage other drivers around me. Basically, I drove the truck how I would drive it during my daily drive if I was low on fuel, and I averaged 29 miles per gallon. Mind you, that is in the thin Colorado air with traffic, stop lights and big hills, so getting near 30mpg without any special methods is impressive for a half-ton truck. For decades, the truck community has been calling for half-ton trucks with diesel engines that combined performance, capabilities and fuel economy – and the new 3.0-liter PowerStroke answers those expectations perfectly. This is the diesel F-150 that Ford fans have been calling for to battle the EcoDiesel Ram 1500, with more power, more capabilities and better fuel economy – all of which lead to a great engine option for anyone who is looking for a truck that shines with and without a heavy load. I absolutely agree that Americans want diesel pickup trucks, but I'd disagree that we've yet to get one. Only those who want a fancy and expensive pickup north of $40K get a diesel pickup, but everyone who wants or needs a reasonable pickup is still waiting. First up was the Ram 1500 with the Ecodiesel V6. They came close to giving America the first diesel pickup offering it as low as around $38K in a quad cab, but the problem is that at the time they offered their diesel, one could buy a Ram 1500 regular cab work truck for around $25K, so $13K more for a pickup that is more than some want or need in a pickup is a lot to pay extra for one with a diesel engine. I heard rumors that one could get a regular cab long bed for around $34K, and if that were true, then Ram truly got close to offering, but I never saw such an animal on a build site, nor did I ever see one in real life. Then came a much-awaited 4 cylinder from GM. A 4 cylinder that's cast iron that uses solenoid injectors in a mid-size truck, south of 200 horsepower ought to be offered at a reasonable price right? Wrong! GM sells the Colorado and Canyon starting under $22K, but the cheapest Duramax diesel starts with 4 big doors, lots of fancy features and dedicated towing features and requires $36K. GM's entry was baffling to me. They went through great lengths to reduce costs for this diesel. They brought back cheaper solenoid injectors which left for a while when "clean" came to the diesel market; they use the cheapest material that can be used for an engine block. They have it built in Thailand, but yet they can't give it up for less than $14K over the base price of those trucks. Now we have Ford's entry. Ford is normally very good at letting customers choose any of their engines even in the lower trims and smaller configurations. For example, you can build on their website the most basic F150 with the base 3.3L, the 2.7L twin turbo Ecoboost, and the 5.0L V8; adding a grand for each step up, and to get their top-tier engine, all one has to do is take a long bed and a little more money. But when the diesel came to market they've gone the way of GM. The F150 starts at or about $27.4K before destination. The cheapest diesel, however, requires Super Cab and Lariat trim and then an extra $4,000 bringing the truck that starts under $29K up to $46.4K for the cheapest version of the diesel. GM is up next with an all-new, American-designed, American built inline six. It'll probably used GCI block, but they'll likely use solenoid injectors and find some other cost savings since they'll the advantage of technological progress since this engine will be new from the ground up. But I can almost guarantee, as GM has done with the baby Duramax and the price of the Equinox / Terrain diesel, it'll come in at a high trim level/configuration, and then you'll add thousands of dollars to that price. So I quit waiting on a diesel. I got a 2015 F150 with the 2.7L Ecoboost. I get 24 mpg lifetime, and it cost $27.8K brand new with chrome bumpers, cruise controls, power glass and mirrors and aluminum wheels. The diesel price starts at almost $19K more than my truck. No thanks. Don't need to carry a family. Don't want a monster truck. Don't want a fancy truck. Just a basic, modern pickup with a diesel engine. No one makes one and no one will. They cost too much to build and certify. I'll pass. This has a lot to do with the trucking industry not wanting non-truckers in their lines. Almost no new light-duty vehicles are being built to handle these larger nozzles. Someone needs to come out with an adapter, and that puts oil burners back in their lines, which sometimes, is the only diesel fuel available at some stops; and it also keeps oil-burner light-duty folks from having to wait in line behind inconsiderate gas hogs who pull right up to the diesel pump when the other islands are available.